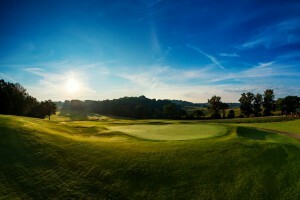 One of the more pleasant surprises experienced by the Golf Road Warriors was our round of golf at Sultan’s Run Golf Club in Jasper, Ind., the stand-alone daily-fee course managed by French Lick Resort. Thirty minutes into the drive southwest from French Lick, I wondered if we were going to end up on the back roads of Kentucky. Corn fields and soybean farms stretched for miles on both sides of the rolling, two-lane road. We passed through tiny agricultural towns with more tractors than cars. We saw big feed silos and industrial factories mired in the ‘50s. And then suddenly we dead-ended at a T-section with the handsome stone gates of Sultan’s Run on the opposite side of the road. Paradise found in the middle of nowhere. Completely remodeled in 1996 by Tim Liddy, a Pete Dye disciple, Sultan’s Run is the former home of Supreme Sultan, a legendary horse that sired a record number of World Champion American Saddlebred horses. (Each tee box memorializes the name of one of Supreme Sultan’s descendants). As every golfer knows, first impressions count. From the time we arrived, it was clear that this club goes out of its way to extend a warm, friendly welcome. It’s even noted in the yardage book: “EXTRAORDINARY BEAUTY! CHALLENGING AND FUN GOLF! FRIENDLY STAFF!” For the record, the golf course was also in pluperfect condition. The blend of grasses is unusual. Sultan’s Run has zoysia tees and fairways, bentgrass greens, and a mix of Bermuda and fescue grasses in the rough. One of Dye’s legacies is his use of different grasses to create visual texture and variety. Liddy follows the Dye playbook to perfection here. On a seasonably cool late summer morning with a thick layer dew on the grass, it was clear from the start we were in for a special experience on this rolling, wooded course, which sprawls across 224 acres. We played the gold tees at 6,429 yards, which were well-suited to our group, though the layout stretches to 6,859 yards for aces and pros. 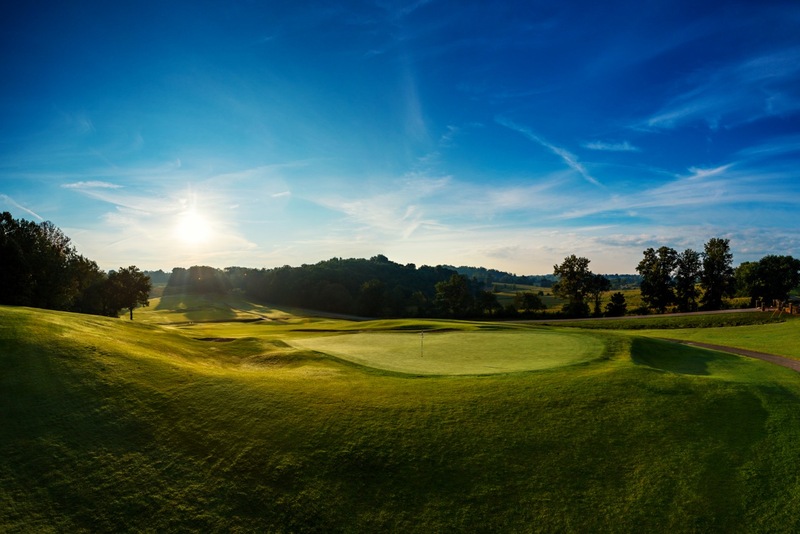 Players of lesser attainment can step forward to the silver tees at 5,842 yards—the course plays longer than the listed yardage due to the ups and downs—while Anita Draycott, an indefatigable warrior, pronounced the green tees at 4,911 yards just right for her game. Carved from a thick forest of coniferous trees, the holes at Sultan’s Run trace the natural contours of the land. You’ll see the Dye influence at each and every hole: Ledged fairways, sculpted bunkers, prominent mounding and well-contoured greens. The short, sporty front nine was a delight. There’s a pair of short par 4’s at Nos. 3 and 7 where accuracy, not distance, is required off the tee. The fourth and sixth holes, each a relatively short par 5, prove that length is not required to present a firm challenge. The fourth is classic Pete Dye: the sloping, straightaway fairway, well-defended by bunkers, turns sharply left at its terminus and drops down to skewed green obscured from view by a prominent mound. It’s a fun scenario, but there are consequences for a miscue. 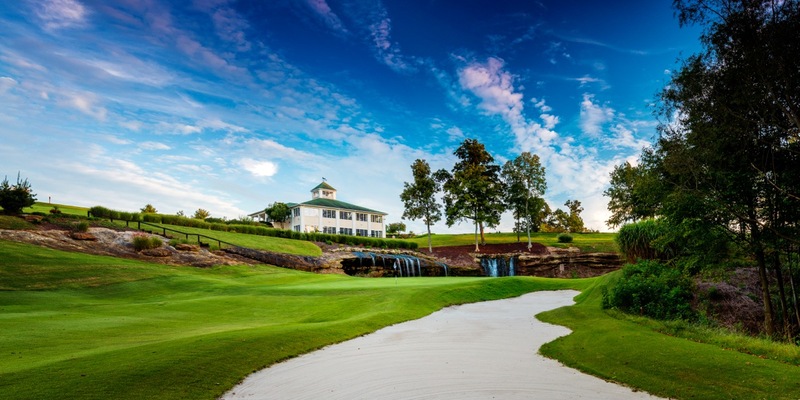 Following a daunting tee shot over a lake to find a rising fairway at the par-4 ninth hole, the sturdier back nine at Sultan’s Run ratchets up the challenge. I particularly liked the par-5 13th, which to me was the embodiment of an American Pastoral tableau. From a slightly elevated tee, the fairway swings around two massive oblong bunkers on the left to a broad landing area. The second shot must hopscotch a weedy creek to find a pitched fairway that climbs to a hilltop green. A sleepy country road parallels the left side of the hole. A lush corn field backdrops the putting surface. Far removed from reminders of civilization, with birds chirping in the trees, this is Midwest golf at its best. In many ways, Sultan’s Run saves the best for last. The par-4 18th, 412 yards from the gold tees, plays over a pond to a sharply angled fairway that proceeds to a gorgeous green site tucked below a stacked limestone shelf. Rivulets of water trickle down the rock into a creek to the left of the green. It’s a beautiful finish to a delightful course that’s well worth the 45-minute detour from French Lick.